Medical imaging is one of the very best applications of technology — it allows us to peer inside of the human body without actually performing surgery. It’s non-destructive testing to the extreme, and one of the more interesting projects we’ve seen over the past year uses AC currents and an infinite grid of resistors to image the inside of a living organism. It’s called Spectra and it is the brainchild of [Jean Rintoul]. Her talk at the Hackaday Superconference is all about low cost and open source biomedical imaging. We’ve seen some interesting medical imaging hacks in the Hackaday Prize over the years. There have been vein finders and even a CT scanner, but when it comes to biomedical imaging, the Spectra project is something different. Right now, it’s just good enough to image organs while they’re still inside your body, and there’s still a lot of potential to do more. Let’s take a closer look a how this works. Like many people who have a solar power setup at home, [Jeroen Boeye] was curious to see just how much energy his panels were putting out. But unlike most people, it just so happens that he’s a data scientist with a deep passion for programming and a flair for visualizations. 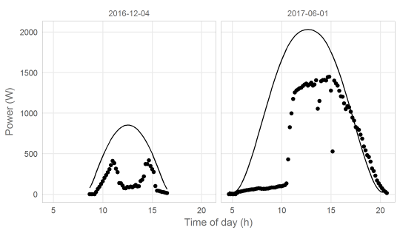 In his latest blog post, [Jeroen] details how his efforts to explain some anomalous data ended with the discovery that his solar array was effectively acting as an extremely low-resolution camera. It all started when he noticed that in some months, the energy produced by his panels was not following the expected curve. Generally speaking, the energy output of stationary solar panels should follow a clear bell curve: increasing output until the sun is in the ideal position, and then decreasing output as the sun moves away. Naturally cloud cover can impact this, but cloud cover should come and go, not show up repeatedly in the data. Expected versus actual power output. [Jeroen] eventually came to realize that the dips in power generation were due to two large trees in his yard. This gave him the idea of seeing if he could turn his solar panels into a rudimentary camera. In theory, if he compared the actual versus expected output of his panels at any given time, the results could be used as “pixels” in an image. He started by creating a model of the ideal energy output of his panels throughout the year, taking into account not only obvious variables such as the changing elevation of the sun, but also energy losses through atmospheric dispersion. This model was then compared with the actual power output of his solar panels, and periods of low efficiency were plotted as darker dots to represent an obstruction. Finally, the plotted data was placed over a panoramic image taken from the perspective of the solar panels. Sure enough, the periods of low panel efficiency lined up with the trees and buildings that are in view of the panels. We’ve seen plenty of solar hacks, but this one has to be something of a first. Usually people are more worried about maximizing efficiency or tracking the sun with them.